James Bow has asked if anyone remembers Blinky, the police car used by the Metropolitan Toronto Police to promote child safety. He remembers Blinky, as do I, and when he hit the web to learn what Blinky's up to now he stumbled upon my first Blinky entry and my follow up a year later. At the conclusion of his entry, James Bow issues a challenge of sorts. I agree with James, it's a damn shame there is no definitive history of Blinky on the web. I remember him well, even if I misremembered him driving himself. I sure remember him talking though, and I can even remember his voice which seems to have been silenced. 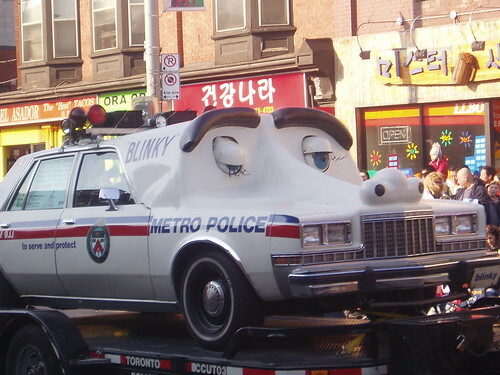 I'm surprised the Metropolitan Toronto Police don't have a page dedicated to Blinky and his history in this city. It's really their bag, and I suspect digging for historical Blinky nuggets would require time I simply don't have right now. What do you remember about Blinky? I remember when Binky used to come to my school in Mississauga! The eyes used to freak me out when they moved! Blinky was a '77 or '78 Plymouth Fury/Dodge Mondaco when he visited us at John Fisher PS somewhere around 1980.
club, and was replaced by the new white ford. It's BLINKY!!!! They have some stupid VW Bug now. Wtf is that? I remember Elmer the Elephant, but I never got a Blinky visit. I remember Blinky being kind of intimately connected in my mind with Elmer The Safety Elephant. I know we had an Elmer flag outside my school by I'm guessing 1973 or 1974. That'd be early primary school. I seem to know I've seen Blinky in person though I wonder if that was at school or maybe somewhere else. The Royal Winter Fair maybe? Roy Wilson worked as a police officer in Toronto from 1948 to 1975 and he was the creator of Blinky the Safty Car and he sadly passed away this weekend (Sunday Jan 20th 2013)of a heart attack, at the age of 85. He live a very full and amazing life. The Wasaga Sun has written a story of his life worth reading. Blinky was actually created in sometime in 1969. I can remember when I first time saw Blinky, he was located at Yorkdale Shopping Center in the late 1960's. I can remember talking to Blinky and he would talk back to me, winked and sang a cute little poem on pedestrian safety. I miss his cute little charm....he is unique. I remember Blinkie visiting my school, and just today I had the pleasure of taking my children to meet him at the 42 Division Picnic. He didn't talk but my daughter and son were still enchanted with him. I seem remember Blinky sitting in the foyer of Midland Ave. C.I. in Scarborough for a day some time in the late '60s/early '70s but that was so long ago that it may have been parked outside the front door. But I think it was inside. He was well known by that time. I had the impression that the eyes & nose part (made of papier mache or at least something with a similar lumpy surface) was removable and could be dropped on the hood of any yellow metro cruiser. As Beverley Wood said, Blinky was created by a police officer Roy Wilson in the 1960's. Roy died January 2013 but he lived in Wasaga Beach and served as the Town Crier for many local events. My husband Bob Michell PC 512 flew model airplanes, so when he took Blinky to the Sick Kids Hospital, he installed servos which allowed the eyes to open and close and honk the horn. This allowed the officers providing the voice to be out of sight when the kids talked to the car. It also allowed children at the hospital who could only look out of windows to see the car blink. I also remember very well Elmer the Safety Elephant. One summer we had 20-25 of them at our home while Bob repaired and painted all of them. My kids loved it! I absolutely remember Blinky the Safety Car, and Elmer the Safety Elephant. They visited Faywood Blvd. P.S. in Toronto when I was a student there in the late 60's--early 70's. I remember the car being yellow, with possibly curly eyelashes. I think they also appeared at the old Toronto Telegram Christmas Fair at the Exhibition grounds around the same time. Anyone remember Officer John from Toronto? He was a tall, imposing, but gentle giant of a police officer who visited our school during those years. I remember he would always say, "the policeman is your friend." Left quite an impression on me, which remains to this day.